Double & Triple wall chimney pipe compatability. We often get calls from customers looking to replace or add to their existing double or triple wall factory built chimney pipe. These products do not mix and match. Each manufacturer has it's own engineers and patents for their product who design the chimneys, and they are not universal (possibly on purpose). You really need to find the manufacturer and model and try to find a dealer or use a "Google" search to locate similar parts if they are uncommon. I took a call yesterday from a gentleman who said his chimney cap would get very dirty and clog up and was looking for a solution. He has an insulated class a chimney and a wood stove. 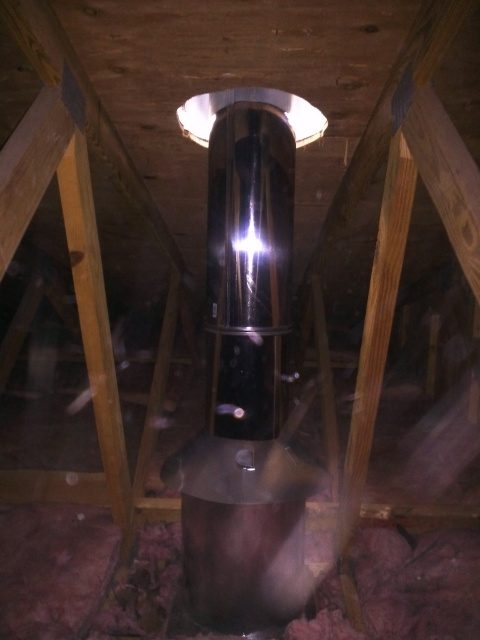 The issue that causes this is the insulated chimney does such a good job of keeping the flue gases hot that it will hardly accumulate in the chimney. Once it hits the cold metal of the chimney cap it builds up rapidly. There is no real solution, however this may help. A lot of caps come with a 5/8" spark arrestor mesh to comply with California regulations and tend to clog the holes in the mesh between chimney sweeps. There is a 3/4" mesh available that eliminates this problem in most situations where the smaller mesh is not required by code. Direct Vent Fireplace using a DCS Direct Vent Pro 4x6 kit. Here are some pictures of a pipe kit we sold to our local installation company of choice "Accurate Installation". This was a complex kit with offsets in both directions and a narrow margin for error when calculating the parts due to the almost exact size exit location through the band board of the home. Another dangerous creosote situation due to improper setup and lack of maintenance. Here is another super dangerous chimney picture. This is the top flue of a chimney that has an old Vermont Castings Defiant stove that was tapped into the flue above the smoke shelf of a fireplace below. 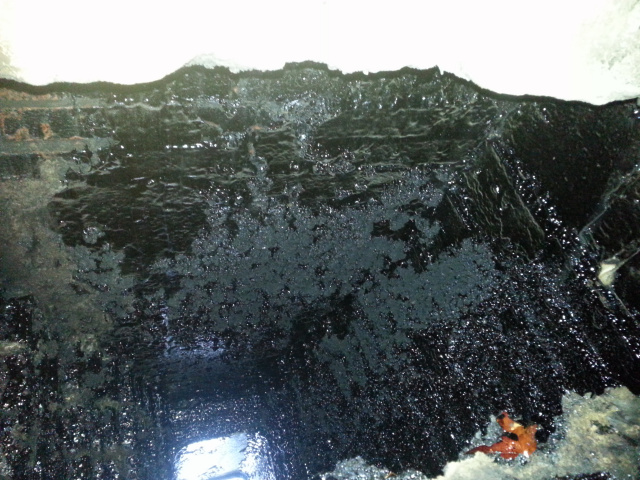 Even a hot eight inch flue into this... 12 x 12 interior chimney was able to develop this kind of creosote. A chimney liner installed and properly scheduled sweeps would make this a much less dangerous setup. 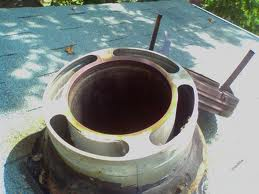 (Example of clean flue on the second picture). Keep it clean, and use a liner. Here is a job our local service affiliate ran into recently. This was a wood burning fireplace insert that had been installed for many years with no liner or maintenance. 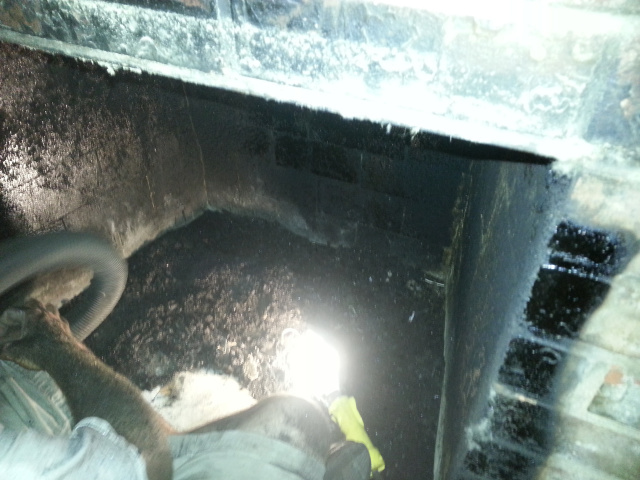 The result was aan extremely dangerous build up of creosote that could result in a devastating chimney fire at any time resulting in loss of property of life. Luckily this customer called to have the chimney serviced before the upcoming burning season. 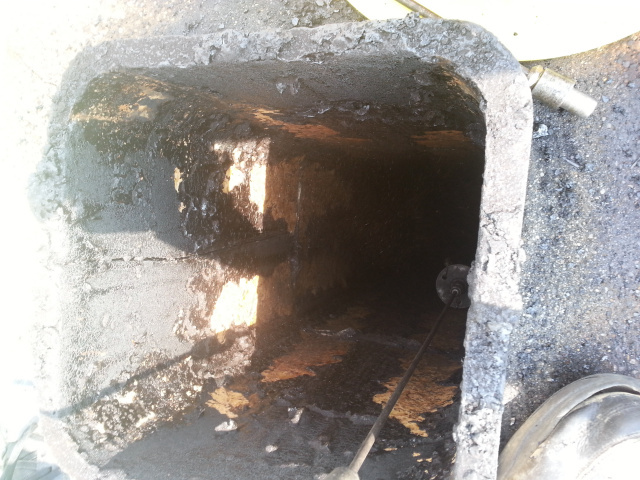 Approximately eighty pounds of creosote was removed and a flexible chimney liner installed to the insert. This person can burn safely with an appliance that will run more efficiently then it ever has. Stay Safe. Be sure to sweep your chimney. Chimney liner to insert through a fireplace damper. This picture shows the typical removal of part of a standard damper housing and some firebrick to allow enough room for a chimney liner to properly navigate it's way through the damper area to be hooked up to an Appalachian 52 Bay fireplace insert. This was a custom rectangle Foreverflex chimney liner to accomodate for the irregular shape flue tile in the existing chimney. Duravent Duratech chimney through wall installation. This is a Dura Tech chimney by Duravent installed in a job from a fire restoration job that our installation affiliates at "Accurate Installation" installed. This project used mostly galvanized option chimney pipe as it is enclosed in a wooden chase box. This job was not fully completed at the time of the photos as a longer length was needed through the wall thimble and the section going through the wall in the picture was added as a drip leg under the tee. 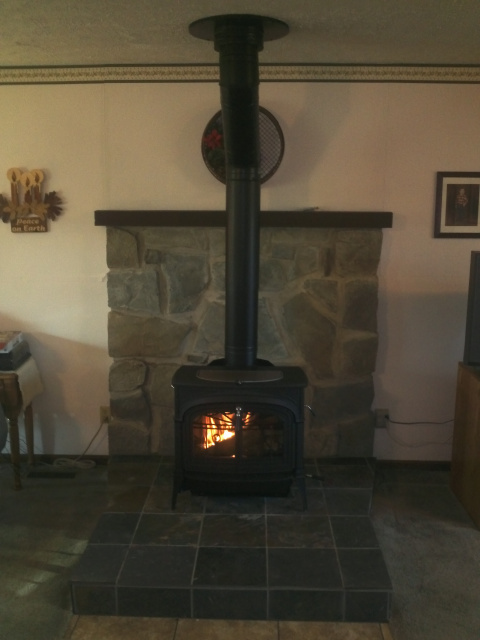 Here is a Vermont Castings Encore freestanding wood stove installed to a Duravent Duratech class "A" chimney we sold. This project was installed by our local installation partner "Accurate Installation" (www.accurate-installation.com) here in the greater Cincinnati Ohio area. This project also used the DVL double wall stove pipe from the ceiling to the stove and a round ceiling support kit with an insulation shield in the attic area.